Rate this Article The release of Pokemon Go has created a worldwide phenomenal awareness on the availability of Augmented Reality games. In this article, we investigate how gaming can be advanced with this amazing AR technology. The release of Pokemon Go has created a worldwide phenomenal awareness on the availability of Augmented Reality games. As we know, Augmented Reality is the process of projecting or overlaying digital images and information onto the real world. It’s not really there but you can see it provided you have the right equipment to see it. Augmented Reality (AR) let’s you use your smart phone or other mobile device coupled optionally with an AR/VR headset to see what the app wants you to see and the real world at the same time. Compared to Virtual Reality where your perception of the things around you is totally altered by the VR headset-device you are wearing, Augmented Reality does not take away your awareness of the real world, at least not completely. You can still see your current environment and even with an AR headset stuck to your face, you can see exactly where you are whether you’re out in the middle of the street or seated in your room. This alone gives you the advantage of evading possible unwanted accidents simply because you don’t know and can’t see where you are. Virtual reality immerses you completely in a simulated environment or game world while AR does not. Augmented reality augments your own world with the game world thus providing you with a unique game experience that staring at a computer monitor, a TV set or turning around 360 degrees in a virtual environment cannot provide. In AR gaming, the key word is “Reality”. You don’t have to leave it to enjoy your game. Though VR may be more popular today, as technology continues to progress, AR will reach a point where it can provide almost the same experience and even more than VR. Reasons why Augmented Reality gaming has been tagged as the gaming of the future. There are two forms of AR gaming available today. For the purpose of simplicity, let’s tag them as Active and Passive AR gaming. Passive gaming is just like sitting in front of your PC or the TV with your game console. You use your smart phone, portable game console ( Ex. PlayStation portable) or your laptop or desktop to play your AR game. You simply stay where you are with no need to rush to the next Poke-Stop to download items. Active gaming is where you have to actually get up from your comfortable couch and run around the neighborhood to accomplish the objectives of the game. Advantage wise, it is good for your health. Almost all of us are aware that sitting or remaining stationary for long periods of time usually contributes to the weight problems and health issues we commonly have today. Even slim individuals who don’t seem to gain weight will get sick over a period of time if this is the routine day in and day out. Also, this kind of gaming causes you to interact in one way or the other with the people around you. Active AR games create communities and teams that actually meet face to face. Talking to someone in person is still the foremost method of communication despite the varied ways we can communicate with others through our high-tech devices. Let’s look at two AR game examples, one for Active and the other for Passive. 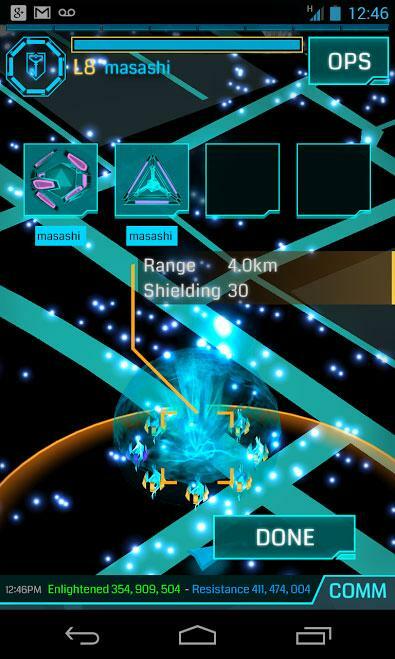 Ingress is one of the most popular Active AR games available today. Said to be the fore-runner of Pokemon Go, Ingress requires the player to run around the neighborhood with your mobile device to certain locations to win the game. Created by Niantic Labs, the same company that made Pokemon Go, Ingress relies on GPS data and network mobile communications to track and accomplish the objectives of the game. Unlike Pokemon Go, Ingress is a story driven game that is set in our current reality or parallel reality if you will. The story of the game revolves around certain controversial topics which are very real making the game more appealing to a mature audience, the premise of which involves the discovery of CERN of the Higgs boson particle and Exotic Matter (XM). The Story is that XM can control human thought and is continually leaking into our world through what are known as portals. Two teams comprised of players known as agents have to work against each other to capture these portals and link them to other captured portals to gain control of an area in the real world. Just like Pokemon, portals may be anything from a monument to a 7-11. The game has created communities for the two sides, the Enlightened (Green) and the Resistance (Blue) who are engaged in a continual battle to control the world. This is one game that really messes the mind. The existence of Dark Matter, the God Particle and CERN’s portal making Hedron Collider are all real as well as the controversy of the Mandella Effect and an alternate timeline. Is it really just a game or is it real? After all, Augmented Reality functions in reality. Good job Niantic! Drakerz-Confrontation is an epic AR trading card game that works just like Magic: The Gathering. Developed by Peoleo Entertainment, Drakerz makes use of trading cards that act like markers in a fiduciary marker system. 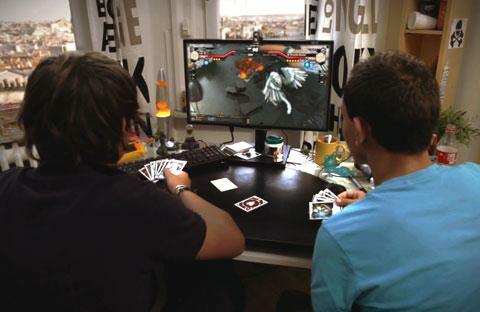 By placing these trading cards in the field of view (FOV) of an imaging system which in this case uses a PC/Laptop with a camera, the game is able to generate animated objects on top of the cards on an image shown on the computer monitor. Moving your cards on the table against your opponent’s cards is no different like when you’re playing Magics, but looking at the computer monitor will show these creatures called Drakerz sitting on top of their respective cards ready to do battle with the other Drakerz. Combat is like watching animated Chess where you see the piece actually move to do away with the other piece. Take your eyes of the monitor and all you see are those colorful trading cards on the table. This is just the beginning as AR has not yet been fully exploited yet, but with the continual pace of development we are experiencing today, who knows what the future of AR will bring.